The Maroon-bellied Conure is often mistaken for the Green-cheeked Conure, although the difference is obvious if the bird is turned over! These gorgeous and affectionate pets are a favorite among many Conure enthusiasts. Like all Conures, Maroon-bellied Conures can be taught to talk! They are quite intelligent and will pick up short words and phrases, though mostly Maroon-bellied Conures mumble to themselves in low Conure-talk! Although they have the ability to screech at incredible volumes, they rarely use it. Maroon-bellied Conures love bathing and should have freshwater at all times. In captivity, they can subsist quite well on a basic seed mixture supplemented with plenty of fresh fruits and vegetables and legumes! Offer a variety of foods so your Maroon-bellied Conure does not get bored! 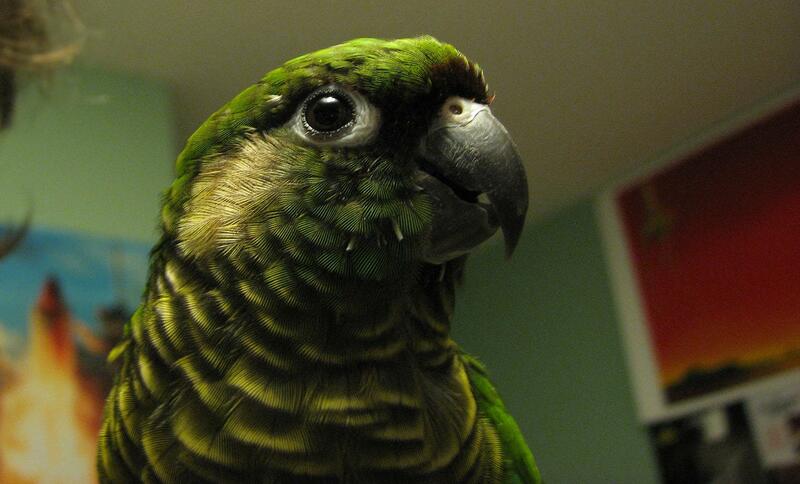 Maroon-bellied Conures have an incredible amount of self-esteem and will challenge animals much larger than they are! They are very curious and love toys. Be sure to provide them with lots of chewing materials, as they have powerful beaks. Maroon-bellied Conures bond very closely with their owners and love affection and playtime! They will go everywhere with their human friends, and even like to shower with them! Maroon-bellied Conures will need a nesting box in their cages for sleeping or hiding if they feel stressed. Most well cared for Maroon Belly Conures can live about 25 to 30 years or more. Maroon-bellied Conures are about ten inches long and weigh just over three ounces. They are predominantly green, and their lower back feathers and abdomens are a mahogany red color. The underside of the tail is a brick red color, as are the edges of the green topside tail feathers. Maroon-bellied Conures have a red frontal band that is narrow, and fades to maroon in color. Their ear coverts are brown and the skin around the periopthalmic ring is white. The olive-green feathers of the neck, throat and upper breast are all edged in a dull grayish-yellow shade. The primary coverts of Maroon-bellied Conures are a deep aqua in color, and the primaries are the same shade, turning to green at the edges. Their feet and bills are dark gray and the irises of Maroon-bellied Conures are dark brown. Native to northeastern Brazil, southeastern Argentina, eastern Paraguay, and most of Uruguay, Maroon-bellied Conures are actually composed of three sub-species. 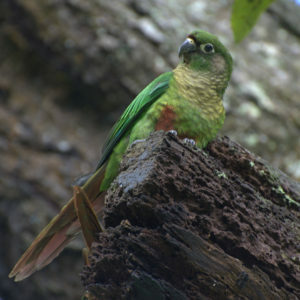 It is believed that early breeders in the United States may have combined the three sub-species unwittingly and that modern Maroon-bellied Conures in America are a composite of the three subspecies. Maroon-bellied Conures remain popular and are known as Braunohrsittich in German. They were first recognized in 1818 by Vieillot. Maroon-bellied Conures love bathing. In captivity, they can subsist quite well on a basic seed mixture supplemented with plenty of fresh fruits and vegetables and legumes! 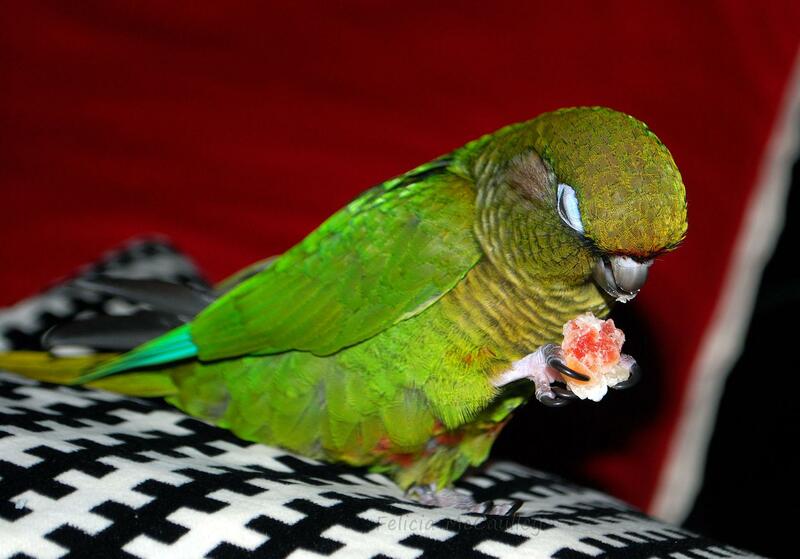 Offer a variety of foods so your Maroon-bellied Conure does not get bored! They are very curious and love toys. Be sure to provide them with lots of chewing materials, as they have powerful beaks. 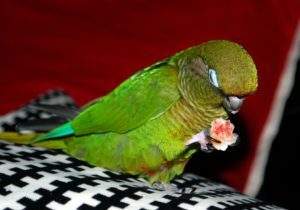 Because they are easy to care for, fairly quiet, and usually quite easy to mate, Maroon-bellied Conures are a great choice for beginning Conure breeders. Maroon-bellied Conures are quite easy to breed. They have very high fertility rates and an average clutch usually consists of around eight eggs! Typically, the incubation period is around 27 days. 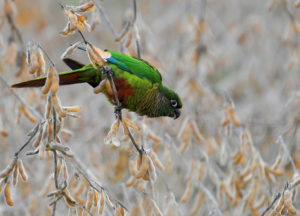 Immature Maroon-bellied Conures differ from adults in the coloration of the plumage, which is duller in young birds, and the iris, which is darker in young birds.